I can't emphasize enough how important it is to have nicely shape and groom eyebrows. In many ways, the perfectly shape eyebrow draws attention to the eyes and enhance the overall appearance of the face. Eyebrow that are too thin or too thick can be distracting rather than enhancing the look. What you want to keep in mind when plucking or shaping your eyebrow is to bring out its natural appearance rather than altering its look. Notice the eyebrow chart. Any professional beautician would follow this chart when shaping their client's eyebrows. 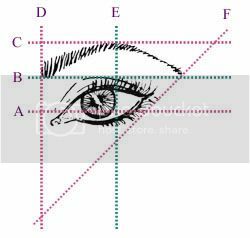 If you look at any celebrity pictures, you would also notice that their eyebrows are perfectly shaped according to these charts. Here are the basic steps to follow when shaping your eyebrows. 1. Use a brow pencil to lightly draw an outline of your eyebrow shape. My eyebrows were overly plucked =( so there's no need to do any plucking here. But normally, you would use a tweezer and carefully pluck any hairs that fall outside of the lines drawn. 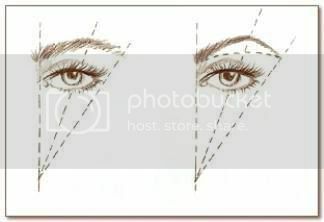 I would not recommend plucking on the upper part of the eyebrow, only the bottom part; since you'd want the gaps between your eyes and eyebrows to be wider rather than closing in. 2. Now use a brow brush (I'm using Revlon's Eybrow Shaper w/color) and brush it in an upward motion. You may use a clear mascara or an eyebrow toothbrush to do this. Afterward, use a scissor and trim of any long and floppy hairs that fall outside of the upper line drawn. 3. Fill in the eyebrow starting from the mid section going toward the end. I'm using Smashbox eyebrow brush and Mac eyeshadow. You may use eye shadow/eye powder/eyebrow pencil to do so. But I would recommend using powder/shadow because it'll give it a more natural look. Also, do choose a color that is one shade lighter than your hair color. This way, your eyebrow will only act as a bystander to help draw attention to your eyes and make it stand out. 4. Now go to the beginning and start filling in lightly. The reason why you wanted to start in the mid section first is because you want the portion from the middle toward the end to look a little darker than the beginning. This way, it'll widened the mid section from where your nose is and makes your eyes appear larger. i'm fed up with mines, i think i'm going to get them tatooed..
oh no, don't get them tattoo. Have you ever heard of eyebrow embroidery? I'm not sure if that's the English term but in Vietnamese it's "phun chan may"...It looks more natural and beautiful than tattooing.